« Goodyear “Support our Troops” Racing Tires? 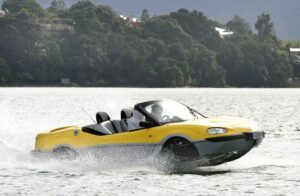 Start-up hopes new amphibian will loosen regulatory deadlock. Hitting a sandbar. Gibbs still hopes to float its car/boat, the Aquada. The dream of producing a fully capable amphibious car could move closer to reality after the company’s Quadski ATV hits the market next year. While Gibbs Technologies plows ahead with plans to begin marketing the Quadski next spring, the progress on the company’s Aquada amphibous sports car has been stalled, but still could proceed with the help of Washington regulators. The problem lies with federal regulators who want the vehicle to meet federal safety and emissions standards both on water and on land. Company officials say that building one vehicle that can simultaneously meet both water and road standards is technically impossible. The answer would seem to lie in a compromise to allow the company’s innovative vehicle to come to market, but federal regulators have refused to budge. In the meantime, Gibbs is doing prototype testing of the Quadski, which as a powersports product, has far less restrictive regulations to meet than a road-going car. The Quadski will be capable of a maximum speed of 45 mph on land or water. The company has not released many other details about the Quadski, however, including price, horsepower or photos of the production version. Gibbs officials said the Quadski, along with subsequent products including a first-responder amphibian and a vehicle designed for the military, could grease the wheels for the Aquada. “(The Quadski) will take away some of the fears the regulatory agencies have,” Gibbs Chairman Neil Jenkins said over lunch Wednesday. On the emissions side, regulators from the U.S. Environmental Protection Agency want the vehicle to meet automotive emission standards, which require a catalyst to fully clean the exhaust. Jenkins said that the catalyst needs to run at about 800 degrees Celsius to work. That flies in the face of U.S. Coast Guard regulations which require an engine bay temperature of 96 degrees Celsius for safety. The EPA won’t allow a bypass system to eliminate the catalyst for use on the water. In fact, Jenkins said that the EPA has a policy says that any vehicle that can operate in two modes – such as on water or land as in the case of the Aquada – must meet the most stringent regulation. There are other problems related to safety. The U.S. National Highway Traffic Safety Administration requires airbags, but pounding over waves on water could trigger the bags. NHTSA has refused a waiver to allow the airbags to be switched off while the vehicle is in the water. “The agencies have been dealing with a paradigm and it’s difficult to get them to change it,” said Tom Mielke, Gibbs’ marketing director. Jenkins said that while many people look at the Aquada and see a car that can operate like a boat, he thinks it really is neither. “While it looks like a car and looks like a boat, it’s really not related to either of them,” he said. To that end, company officials try to avoid the terms car or vehicle when describing its products in a generic sense, preferring instead the term amphibian. Ultimately, if Gibbs cannot win approval to sell the car in the U.S., it may begin building it for the rest of the world, where approval will be much easier, Jenkins said. The prototype version of the Aquada is a three-seat mid-engine sports car that looks vaguely like an oversized Mazda Miata. Current versions of the Aquada are capable of about 30 mph in water, but an engine upgrade planned for the production model would give it a top speed closer to 40 mph. The current vehicle does not have a stowable top, doors or air conditioning, but Jenkins has acknowledged that those features will be necessary for the production version. This entry was posted on Friday, July 2nd, 2010 at and is filed under Automobiles. You can follow any responses to this entry through the RSS 2.0 feed. Both comments and pings are currently closed. Interesting project. To bad the government, that knows next to nothing about anything, has to stick their nose into someones good ideas & projects. I remember the “Amphicar” of the ’60s & knew friends who owned & used them. Neat cars! I hope you succeed with this project. What a shame! Politics, that’s all it is. This aqua car would be a real boost to our economy as well as an amazing vehicle. I own an Amphicar & I feel that the politics of the day just destroyed all hopes of the Amphicar becoming all that it should have become in the late 1960s. I am all for the government’s efforts to require manufacturers to make the cars we drive cleaner. I’m all for safety regulations, pressing automakers to make our cars safer. What I have a problem with is when government stands in the way of innovation.